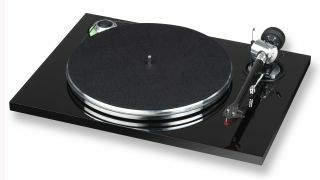 EAT announces its cheapest turntable yet, the £999 Prelude | What Hi-Fi? When we reviewed our first EAT product, the B-Sharp Super Pack turntable, last spring, we all agreed on two things: that the company name was odd (it stands for ‘European Audio Team’), and that the turntable sounded very competitive for its £1370 price tag. Fast forward almost a year and we have news of EAT’s cheapest turntable yet. The Prelude is the high-end turntable brand’s first deck under £1000 - priced £999, it just avoids a four-figure sticker. It features a heavy platter to help ensure speed accuracy, a single-piece, lightweight carbon tonearm tube, which the company says is ideal for reducing resonances with moving-magnet cartridges, and a pre-fitted Ortofon 2M Red MM cartridge that we know is pretty good. EAT has chosen to use the same base material found in its higher-end designs - a stainless steel bearing in a soft bronze bushing. And rather than finish its chassis with a veneer has instead gone with the more sophisticated method of applying eight layers of piano lacquer to the MDF base. The motor is free-standing so that it doesn’t pass vibrations to the board, and the inclusion of a mass bearing block for the tonearm and counterweight works to absorb resonances from the cartridge. An anti-resonator damper on the counterweight aims to limit inherent resonances, too. The EAT Prelude turntable is available from next month for £999. EAT has also introduced a new £1249 valve-based phono stage, which is available now. The E-Glo Petit – the smaller sibling of the company’s E-Glo S – has a hybrid tube design with 12AX7 valves protruding from the top plate. A specially designed power supply enables the tubes to remain ‘hot’ at all times and therefore perform at their optimum throughout listening, while the use of J-FET transistors delivers a signal-to-noise ratio of only 87 decibels. The E-Glo Petit is compatible with MM and MC cartridges, and offers adjustable impedance and capacitance controls.